I just went ahead and cooked up the whole butternut squash this time since I am going to be using it for other recipes. It's so simple. Just slice the squash in half, scoop out the seeds, and place face down on a sheet pan. Then add a cup of water and bake at 350º F for about 40 minutes or until fork tender. I just scooped out all the insides with a fork, shredding it as I went along. I scooped it all the way down to the skin. You definitely don't want to waste any of this great tasting squash. Voila! Butternut squash puree. It's that easy. I let this cool off a little before baking with it. Or if you want you can make it ahead and store it in the fridge in an airtight container. For the topping, I wanted to add a little texture instead of a glaze. So I chose to do crumble. I only put about a teaspoon of topping per donut. If you want more, just double up the recipe and add more. The butternut squash, maple, and allspice work so well together. You can taste each flavor, neither one overwhelms the other. 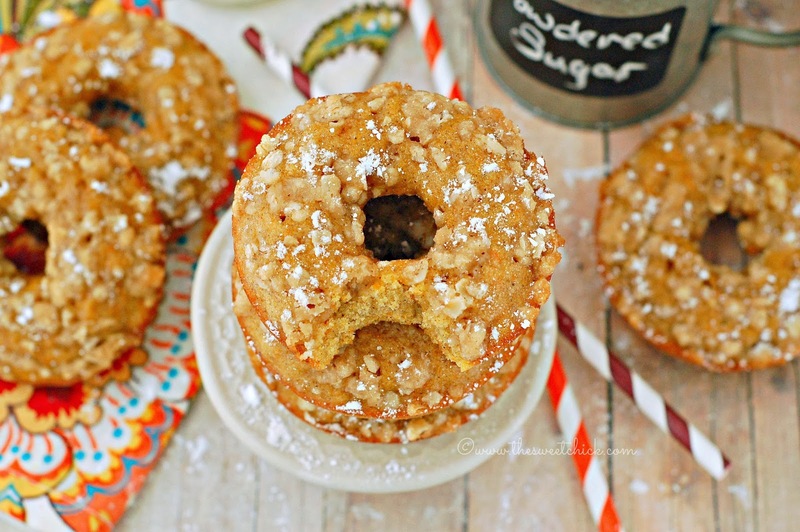 They blend smoothly to make a slightly sweet, light donut that is great for any occasion. You can sprinkle a little bit of powdered sugar over the tops before serving if you want. I love messy donuts! 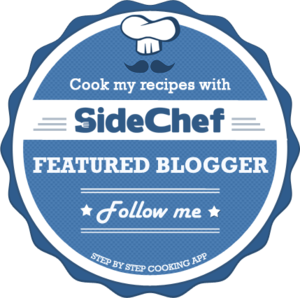 In a stand mixer, beat together the oil, syrup, eggs, sugar, squash, spice, salt, and baking powder until smooth. Add the flour and mix on low until all incorporated. Fill the wells of your greased doughnut pans about 3/4 full. I used a little less than 1/4 cup of batter per well. I just filled them with my measuring cup. No fancy equipment this time. Mix the sugar, flour, and oats together. Then add the butter and mix with a fork until all crumbly. Sprinkle about a teaspoon of the crumble evenly over each doughnut. Then bake the doughnuts for 15 minutes at 350ºF or until a toothpick inserted in the center comes out clean. After you remove the doughnuts from the oven, wait a few minutes before taking them out of the pan. If you can't wait for them to cool because the smell is too intoxicating, then go ahead and pop one in your mouth. Just don't burn yourself! These look delicious! I love flavor combination - it's screams fall, and warm doughnuts are a perfect treat on a cool fall day! Perfect to dunk in a hot coffee or tea. 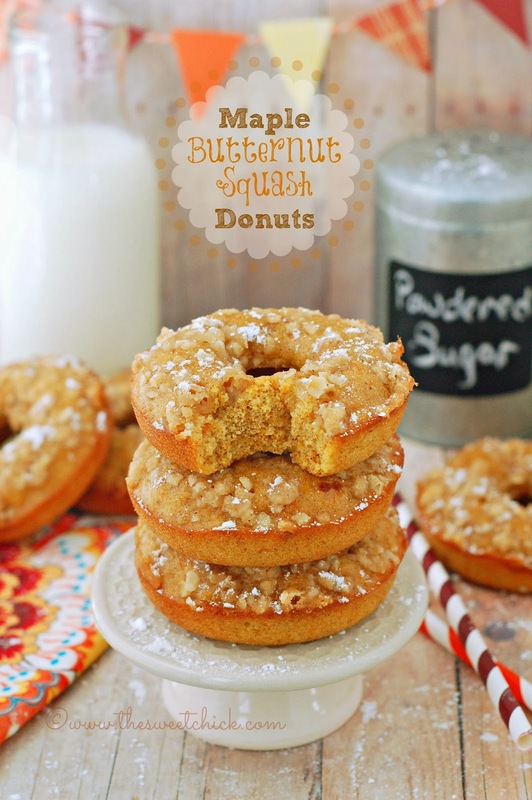 I love pumpkin and maple so I am sure I would love these butternut squash and maple donuts!! It's even better than pumpkin/maple! These were delicious! 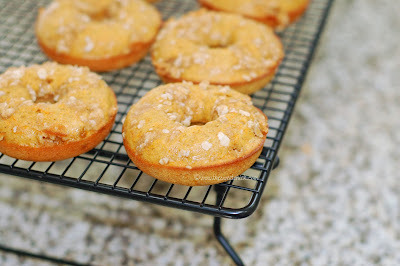 I'm sure your crumble would be yummy too, but I made a maple butter glaze instead (my kids would be less suspicious of the butternut that way, LOL) Great recipe, the batter made up a very tender baked donut. Thanks! So glad you like them. A maple butter glaze sounds good to me. Anything with maple is good!